surprises of his own for the new Mrs. Rokesby. When Edward comes to, he's more than a little confused. The blow to his head knocked out six months of his memory, but surely he would recall getting married. He knows who Cecilia Harcourt is—even if he does not recall her face—and with everyone calling her his wife, he decides it must be true, even though he'd always assumed he'd marry his neighbor back in England. OH MY GOODNESS!! IT IS FINALLY HERE!! *major fan-girl moment* The prequel to the Bridgertons series (technically a Rokesbys book) is here!! 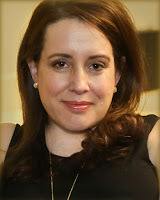 ; and if you couldn't understand me through all that nonsense before, the amazing Julia Quinn is back with a new book, and she manages to do what many fail to do! She has written an amazing prequel, to a equally amazing series! From the beginning of The Girl with the Make-believe Husband, We find our heroine, doing something mighty brave, but also mighty foolish at the same time! After finding out her brother has been injured fighting in the colonies, Cecilia Harcourt was forced to make a hard decision, marry her cousin, and be in the clutches of her scheming aunt, or go search for her brother and his best friend in the new world...so she did what any sensible young miss would do! She left for the colonies, only to find it even more dire when she arrived! Her brother still missing and his best friend Edward Rokesby, unconscious! Trying to prevent a scandal, Cecilia claims she is Edwards wife, but luckily for her when Edward does come around, he's suffering from amnesia!...And I'm going to leave my recap there, so I don't give anymore details of the book away. 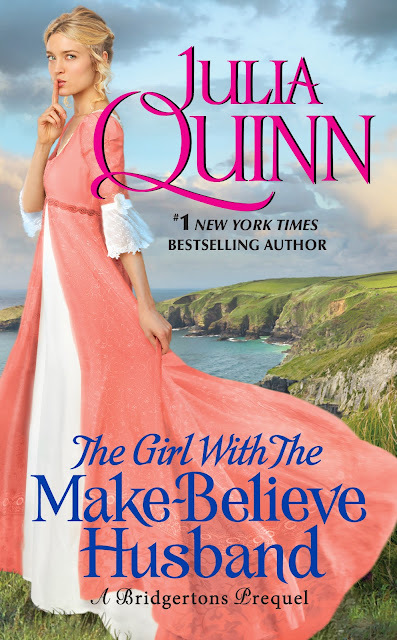 The Girl with the Make-Believe Husband is a darling of a book, and though short (it is a prequel after all), you cannot help but fall in love with every single moment of it. When you read the book, you cannot help but be blown away by the authors imagination and talent! Honestly, this one book has reaffirmed my love for the authors work, from the character's, to the plot, from taking me out of my comfort zone, and making me fall in love with a new world book, which is something I normally detest. The author has given me a teaser of a new series to fall in love with, while giving me a glimpse of the old series I simple adore. I give The Girl with the Make-Believe Husband 5 stars! But this particular pounding—the one that felt more like someone was bashing his skull with a cannon (not a cannonball, mind you, but an actual cannon) seemed to indicate that he had been attacked with a blunter instrument than a bullet. That war he’d mentioned... people did die. A week. Edward thought about this. A week meant it must be... March? April? “It has been nearly two months,” she said quietly. Or not. He’d never actually met the lady, he felt like he knew her. She wrote to her brother with a diligence that was unmatched in the regiment. Thomas received twice as much mail as Edward, and Edward had four siblings to Thomas’s one. Thomas carried a miniature of her, and even though he said it was several years old, Edward had found himself staring at it, studying the small portrait of the young woman, wondering if her hair really was that remarkable golden color, or if she really did smile that way, lips closed and mysterious. Somehow he thought not. She did not strike him as a woman with secrets. Her smile would be sunny and free. Edward had even thought he’d like to meet her once this godforsaken war was over. He’d never said anything to Thomas, though. That would have been strange. ...and he seemed to have married Cecilia Harcourt. He opened his eyes and tried to focus on the green-eyed woman peering down at him.